Don’t mis sout on the Dada life experience at MMW 2018 . This miami music week DADa life will be playing at multiple locations. This event will be hosted at the Shore Club . Get your Dada Life Magnificent Rave Spa PROMO CODE “NOCTURNALSD” Miami Music Week Shore Club 2018 discount tickets now. Set up your vip bottle services, vip tables, guest list, hotel room, travel and transportation services now. There has never been a better time than Spring Break 2018 to come down to Miami Music Week for the 6 day long big shows and big talent names ! The shore club south beach miami hotel will be hosting this all day long party don’t miss out save money on these cheap discount tickets for sale now . Dada life stefan machine made . currently only early bird general admission passes are available for this event. Stay tuned. vip bottle service tables and cabans miami music week pricing. Don’t miss this performance get your tickets and passes now. 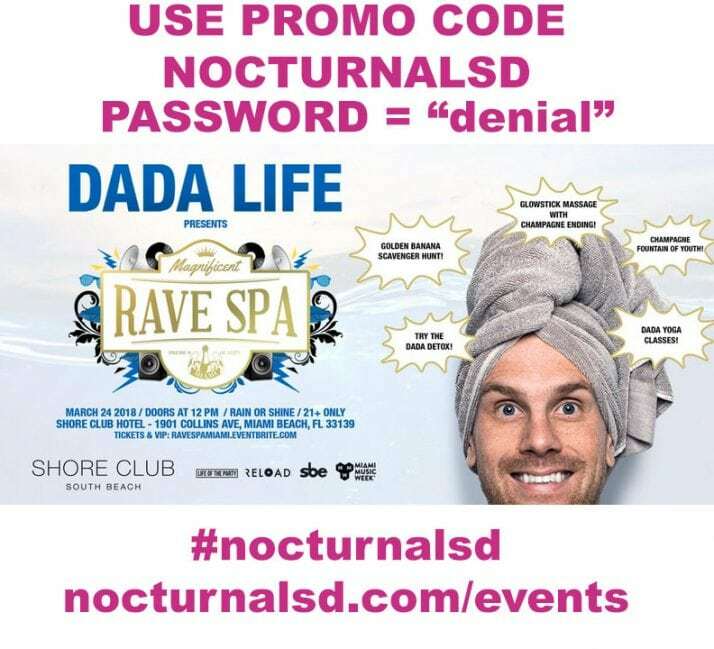 Promo code nocturnalsd at all of dada life shows.